As a part of my master's thesis I have to work on some optimization methods which are in turn operating on a heavy mathematical model -- one evaluation may take about a second or even more depending on the implementation. Currently I'm working on a genetic algorithm optimizer based on excellent PyEvolve module for Python. The original optimizer has been written by my tutor in pure C++ with GAlib taking care of genetic computation. Originally it uses a steady state genetic algorithm engine but I switched it to the simple GA engine that is compatible (although slower) with one present in PyEvolve. That way it was easier (or even fairer) to compare results and performance. # Iterating over main blocks in X axis. # ... same for Y axis. # Numerical quadrature in [-1; 1] x [-1; 1] square. for ix in xrange(4):  # Integration along X axis. for iy in xrange(4):  # Integration along Y axis. # Result transformation to original area. Yes, this code is awfully inefficient but in C it really doesn't matter that much (very unlike in Python). Also this function is being run tens or even hundreds of times for every GA solution. Let's just say that even in very primitive GA run the most inner loop is executed 30.000 - 50.000 times. Of course this function could be possibly replaced with some SciPy's quadrature function -- that's the next exercise for me. The original C++ optimizer used some custom genetic operators which turned out to be a bit worse than PyEovlve's default ones. I ported them anyway so my results wouldn't differ much between implementations. I put up these operators' code on Github, they're not really important in this story. ctypedef void* const_void_ptr "const void*"
ctypedef char* const_char_tr "const char*"
# Getters/Setters/Utilities doing work on CppClass objects. # Initialize pyximport so you can import cythonized modules. # Import your module from .pyx file -- this will invoke background compilation. Cython will try it's best (using distutils) to prepare a module for you. Intermediate files are usually placed in your home directory under .pyxbld/ path -- don't worry about them. You can also customize the way your module is being compiled by creating a module_name.pybxld file in the same directory as a .pyx file. This Stack Overflow answer will get you started -- the rest is just distutils documentation on building extensions. Cython is after all not that bad, until you want to something more advanced like passing a Python list of floats to C++ code. The only way I found to solve this is by copying memory: you allocate a new array and fill it with a list data in a for-in-range-len loop. Of course you have to manually free the memory taken by this array -- let's hope you know when it's finished with (or you'll get a segfault). The second implementation was a complete rewrite of optimizer code and underlying model to pure Python code using NumPy arrays. After getting around C++'s multiple function signatures I finally got the same numerical results as the original optimizer. But it all came with a huge price. The aforementioned deeply nested loops were terribly. unacceptably slow. The execution time increased three or four orders of magnitude. Then it hit me -- I can use PyPy as well, at least there would be some JIT optimizations. Unfortunately we can't run NumPy under PyPy (although it is work in progress). I stripped all NumPy array and linalg calls from my code.What's interesting that even under CPython this version run actually faster. First few tests under PyPy have left me speechless. 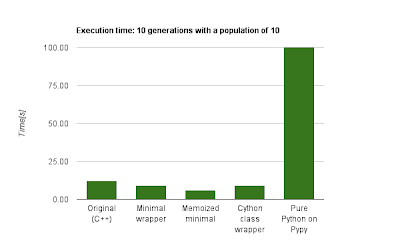 Now this really heavy, Python-unfriendly code executed only about ten times slower than original written in C++ -- bravo PyPy devs!! generally, calling many functions from a heavy (and nested) loop is not a good idea. Performance issues have led me to write yet another implementation. 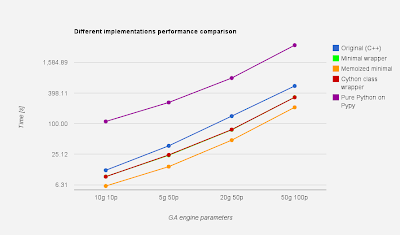 The last implementation is a really thin Cython wrapper around original optimizer code. It doesn't directly interact with the underlying mathematical model. The only thing that's left (written in Python) is the code related to PyEvolve (and argument parsing if you need to know). I do all initialization steps in C++ layer by calling one C-externed function then wrapped in Cython without any data conversion. Then I call a similar function to fetch optimization constraints and variable count. PyEvolve does all genetic work and calls another wrapped function to do evaluation in C++ model. This one trick allowed me to cut down the execution time by thirty to fifty percent. 50 generations with a population of 100. Kubuntu 11.10 with Linux 3.0.0 kernel. It's obvious that the pure Python version is the slowest one (not particularly Python's or PyPy's fault). 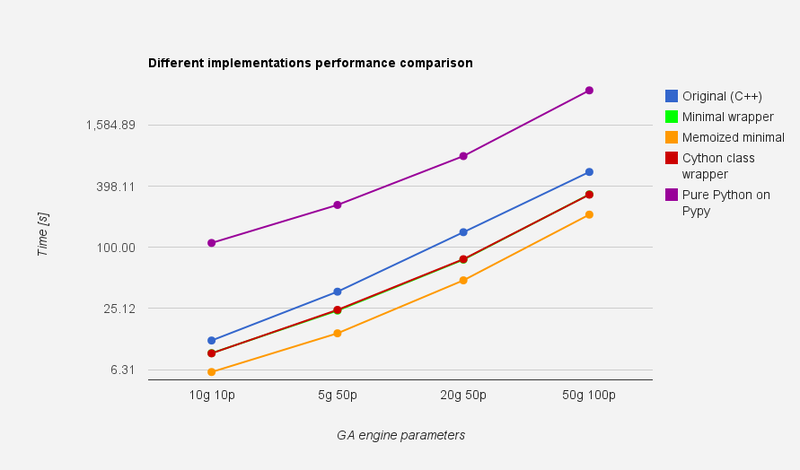 On the other hand wrapping C++ (and C) code with Cython adds no real performance penalty . It's also pretty straightforward -- the only annoying part is frequent recompilation. PS. Use that profiler for your high performance applications. You can try either using PyPy's numpy (although linalg wouldn't work for now) or use list-strategies branch. It should be vastly faster, probably to be merged soon (but not going into 1.7 release). The main difference is that if you have a JIT, you *don't* unpack numpy arrays - they stay as optimized integers/floats.